Daily temperature records for November 4 were tied or broken at many locations in southern California on Thursday. It was the first time ever that 100° has been recorded in November at San Diego. Laguna Beach broke an 81-year record high minimum temperature by 16°. Following record-setting daily rainfall on Monday, Seattle tied its all-time record high November temperature on Wednesday. The precipitation of 1.56" broke the daily record for November 1 of 1.06" set in 1984. This was only the 5th time in over a century of records that the temperature reached 70° or above at Seattle in November. FOLLOWING IS A SUMMARY OF 70 DEGREE DAYS IN NOVEMBER IN SEATTLE. WERE NOT AS WARM AS WEDNESDAY. YEARS. 1980 WAS A NEUTRAL YEAR. Cliff Mass has some background in his weather blog. See here for other Political Science posts. November 5 Update: Think Progress today reviews the four fossils competing to run the House Energy Committee: Rep. Fred Upton (R-MI), Rep. John Shimkus (R-IL), Rep. Joe "BP" Barton (R-TX), and Rep. Cliff Stearns (R-FL). November 4 Update: Only half of the Republican freshmen in Congress are overt science deniers. Climate Progress has the scorecard. ThingsBreak has the rundown on Rep. Ralph Hall (R-TX), who has "staked his claim to the chairmanship of the House Science and Technology Committee." And, of course, there's that classic from the Speaker-to-be of the House: "The idea that carbon dioxide is a carcinogen that is harmful to our environment is almost comical." On the other hand, California defeated Proposition 23. The Gold Guy finds some silver linings. Continuing the pattern established in the spring, extending through the summer and into September, new record high temperatures are outpacing record low temperatures in the U.S. for the 8th consecutive month. 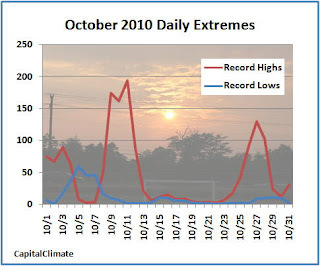 Preliminary data from the National Climatic Data Center (NCDC) for October show over 1500 new record highs, vs. slightly more than 300 lows, giving a ratio of 4.75 to 1. For the year to date, new highs are exceeding new lows by a ratio of 2.8 to 1. Reversing the trend in September, new record warm minimum temperatures also exceeded record high maximums as they have in nearly every month so far in 2010. The excess of high minimum records was particularly strong in the summer, when as many as 3761 were reported in August alone. With the exception of a cold spell from October 5th through 7th, record highs equaled or exceeded record lows every day of the month. The large monthly excess of heat records vs. cold records was driven by two very warm spells, one in each half of the month. The first one, around Columbus Day, peaked on the 11th, when 194 record highs were set, vs. only 1 record low. In a 3-day period, 530 heat records were set, over 50% more than the cold records for the entire month. In connection with the Minnesota Maxi-cyclone late in the month, many more records were set in the eastern half of the country. There were 325 individual record high temperatures from the 26th through the 28th, more than the total lows for the whole month. During the same 3 days, there were only 18 record lows. - Total number of daily high temperature, low temperature, and high minimum temperature records set in the U.S. for spring 2010 (March-April-May) and monthly from June through October 2010, data from NOAA National Climatic Data Center, background image © Kevin Ambrose (www.weatherbook.com). Includes historical daily observations archived in NCDC's Cooperative Summary of the Day data set and preliminary reports from Cooperative Observers and First Order National Weather Service stations. All stations have a Period of Record of at least 30 years.